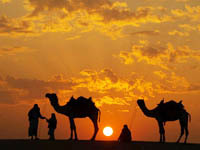 Jaisalmer in Rajasthan paints a real picture of Arabian Nights. Coming straight from your Arabian Night imagination, Jaisalmer is a jewel of the desert state and is dotted with forts, havelis and palaces. The best time to take a tour to Jaisalmer in Rajasthan is October-March. Jaisalmer is aJaisalmer - Rajasthan beautiful town dotted with forts and palaces. There are numerous tourist attractions in Jaisalmer that will undoubtedly make your Jaisalmer tour an unforgettable experience. 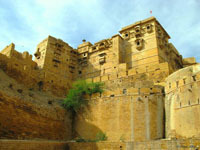 Jaisalmer Fort is the second oldest fort of the state and offers surely a vision of beauty and charm. The Fort of Jaisalmer has retained its old charm. Stroll around the market outside the fort. Havelis of Jaisalmer invite you to walk through the memory lane of nostalgia. Jaisalmer's havelis are known for their explicit artworks and carvings and are examples of blend of Rajput and Islamic style of architecture. For an ideal picnic with friends and family, visit Gadsisar Lake. For adventure enthusiasts get a peek into desert life. 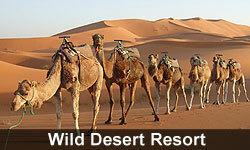 Visit SAM sand dune and enjoy camel safari. Jaisalmer is one of the most loved towns of Rajasthan. As a tourist destination, this city renders countless moments of pleasure for the yearning tourist. The traditional warmth and culture dominates the city of silvery sand dunes. The special magic and aura that this city creates is another feather in its cap. The city manages to sustain even during Brisith Raj and Mughal dynasty. Once a year in winters and on the middle of the continually rising and falling stark yellow sands of the great Thar Desert, the empty sands around Jaisalmer come alive with the brilliant colour, music and laughter of the Desert Festival. The festival is organised by the tourist authorities as tourist entertainment around January-February. The very rich and colourful Rajasthani folk culture is on show here for a few days. Rajasthani men and tall beautiful women dressed in their brightly costumes dance and sing lingering ballads of valour, romance and tragedy. Traditional musicians attempt to outdo each other in their musical superiority. The high points of the festival are - snake charmers, puppeteers, acrobats, folk performers do rapid trade. Camels, the lifeline of the desert, play a foremost role. Proud moustached villagers, dressed in their ethnic best come astride their picturesquely caparisoned camels to join in the camel dances and competitions of camel acrobatics, camel races and décor, camel polo, tug of war and the like. The tourist dances, turban tying competitions and tug of war are big draws and laughter. The Mr Desert competitions, which are focused around the length of moustaches by and large, attract many hopefuls. Gadsisar Lake in Jaisalmer, the rainwater fed reservoir, was built in 1156 AD and rebuilt in 1367AD by Maharwal Garsisingh. The beautiful mansions built by Jaisalmer's wealthy merchants are known as 'havelis' and several of these fine sandstone buildings are still in beautiful condition. Patwon ki Haveli is the most elaborate and magnificent of all the Jaisalmer havelis. As time passed by, Ramdevji became well known in Rajasthan for his miraculous powers. The Hindus who had become Muslims under compulsion from the Moghuls started reverting to Hinduism. 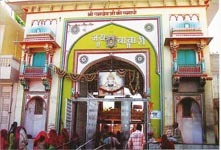 The Fakirs (Muslim religious devotees) reported this disreputable situation of Muslims to the Pir of Ajmer. The Pir of Ajmer asked the Fakirs to go to Multan (a place on the border of Afghanistan and Pakistan) and see Mustanapir, Dagdupir, Bajrukshahpir, Gadadiapir, Dilavarshahpir and Jabbarpir and follow their advice. The Fakirs went to Multan and saw the Pirs who in turn sent the Fakirs to see their superiors Musapirs and Charalshahpir. After listening to the pleas of the Fakirs, Musapir decided to go to Runeecha (Ranuja) with his small delegation of five Pirs (including himself) and he sent a message to all Fakirs of Multan to arrive in Runeecha (Ranuja) on Maha Sudhi 2 so that he could take some tough tests of Ramdevji, the aim being that if Ramdevji failed the tests then Musapir could ask Ramdevji to stop people calling himself a Pir since Hindus do not have Pirs. The golden - yellow sandstone of Jaisalmer Fort, over 800 years old, crowns the Trikuta Hill. Within its walls, defended by 99 turrets, lies the old city, nearly a quarter of modern Jaisalmer. It is believed that Krishna had forecasted to Arjuna that one of his progeny down the line would set up a kingdom on the hill. The prophecy came true when Rawal Jaiswal, who belonged to the Yadava clan of Krishna, shifted his kingdom from Lodurva to Jaisalmer in 1196 due to repeated attacks by foreign invaders. Jaisalmer flourished due to its strategic location on the trade route connecting Central Asia and the Far East. The legacy of the rich merchants and their havelis with intricately carved details can still be seen today inside the fort complex. Held in the months of January-February, the Desert Festival exudes a delightful spirit. For three days, the otherwise barren land of Jaisalmer comes to life and is clustered with hordes of colourfully dressed people. The Government Museum in Jaisalmer is situated on Police Line Road near Moomal Hotel. It was opened in 1984. The large collection of wood and marine fossils in the museum gives an insight into the geological past of the area. Outside the fort is the main market place called Manak Chowk, which is the centre of local activity. From Manak Chowk, one can walk into the lanes where the famous carved havelis are to be found. Each haveli's facade differs from other. Built mainly during the 18th and 19th centuries, the carving in the havelis of Jaisalmer is of a very superior quality. For anyone interested in seeing the culture of Jaisalmer on display through the ages, the Lok Sanskritik Sangrahalaya or the Museum of Folk Culture situated on the bank of Gadsisar Lake in Mehar Bagh Garden is a must. Gadsisar Sagar is a scenic rain water lake with numerous beautiful shrines around. The lake is an idyllic spot for outings and picniking. This group of fine Jain temples were built in the 12th to 15th century within the Jaisalmer Fort. They are beautifully carved and dedicated to Rishabdevji and Sambhavnathji. Bookmark this page Printer friendly version Email this page Located 11 kms off the Jaisalmer Road, Kailana Lake is a picturesque lake. One can witness the spectacular sunsets and cherish the beauty of the place. These are conducted on many routes. Any trip to Jaisalmer is indeed, incomplete, without a trip to the most panoramic dunes of Sam where the wind is unceasingly carving out scenic patterns, on the sand! Situated 42 kms from Jaisalmer, the sun-soaked Sam Sand Dunes bring to light a glided mirage. Truly the essence of the desert, the ripples of the wind-caressed dunes create an enchanting mirage. Wood Fossil Park at Aakal, is 17-kms from the city of Jaisalmer. Lying on the Barmer Road, this park transports you back to the Jurassic period, when the whole Thar region lay under the sea. The park with 180 million-year-old fossils that are the geological landmarks for the study of the Thar Desert is any geology enthusiast?s delight. Only 3-km or so north of Jaisalmer, Bada Bagh is a fertile oasis, with a huge old dam on the banks of an artificial lake. The enchantingly scenic backdrop of a dainty lake and the dam in the middle of the plateau, add to the beauty of the place. A tiny yet lively town in sun - drenched sands, Barmer is a miniature Rajasthan with all its colour, warmth and tradition. 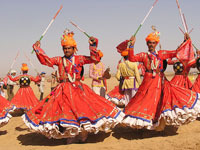 Although a barren land with harsh climate and tough terrain, Barmer is known for its rich crafts, dances and music. Once on the ancient camel trade route, the town in now the centre for wood carving, pottery, carpets, intricate emboidery work, block printed fabrics and multi- hued traditional costumes. It preserves the eco-system of the desert within its confines. The Monitor lizards, desert foxes, porcupines, occasional wolves and black bucks, and the Great Indian Bustard (a protected bird ) are found here, forming an ecological chain revolving around cactii and other hardy desert plants. The Desert Festival takes place in January-February of each year. Camel races and dances, folk music, desert ballads, puppeteers - they're all part of the activity. At the full moon night, a sound and light drama is performed at Sam. Jaisalmer is 290-km from Jodhpur via Pokhran, Dechu and Balesar or 330-km from Bikaner via Pokhran and Phalodi. It is well connected by train with Jodhpur and other major cities of the country by a meter gauge line. Jaisalmer has got extreme climate. Best time to visit from October to February. Jaisalmer is famous for mirror work, embroidered articles, woollen pattu and other items made of good quality, locally produced wood, wooden boxes, trinklets, silver jewellery and curios. The Desert Festival is held in January-February of each year. There are Camel races, dances, folk music, desert ballads, puppeteers so on and so forth for the excitement of the visitors.